I have found a hardware bug on a board design after many PCBs have been manufactured but not populated. I can fix the problem by removing a SOT-23 component and putting a wire across two of the pads. I have too many PCBs manufactured that manually installing a wire across the two pads of the removed component is not economical in time or money. How can this be fixed using an automated production method? Are there components available to fix this kind of problem, i.e. a package with just a wire between the two pins? The link in question is one of the SOT23-5 diagonals. One suggestion is to use a zero ohm resistor. These typically come in rectangular packages with rectangular leads. 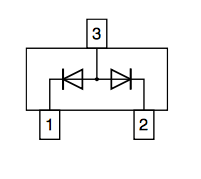 Would a pick-and-place machine handle resistors placed at 45 degrees to the pads? What would happen during reflow? Would the surface tension due to the incorrect alignment of the leads to pads cause the resistor to spin and detach from the intended pad? I've used a 0805 jumper for this exact purpose before. Angle is pretty arbitrary to a pick and place. It may take a little longer to place a component on a 45 than a right angle, but it can do it. During reflow, it's not much different than if it were a normal set of 0805 pads, the jumper will center up between them. It's not ideal for mass production, but it will work to get you through to a revision. As an alternative to the better answer of a sot-23 zero-ohm link, depending on your needs, a sot-23 diode package or array may be better. It would maintain a reverse bias blocking effect like a regulator should. Different configurations exist, in single and dual or quad. Not the answer you're looking for? Browse other questions tagged pcb pcb-assembly production or ask your own question. Any tricks to attaching a wire or pin to a testpoint? What to do with unused pin? STM32F103xxxx VFQFPN 36 pin package thermal pad, isolated or tied to ground?